Michael J. Oard is a creation scientist with a specialization in Atmospheric Science. He is a prolific author who has published numerous books and papers in widely recognized creationist and secular journals. He worked for close to 30 years as a meteorologist/weather forecaster with the (US) National Weather Service, and now dedicates much of his time to creation science research. Mike's research interests have focused primarily on topics such as geological evidence for Noah's flood, the Ice Age, and the mass extinction of the Woolly Mammoths. 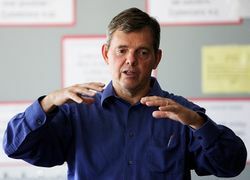 He speaks regularly at creation conferences and other venues for Creation Ministries International and has served on the board of directors of the Creation Research Society since 2001. Mike received his Masters of Science degree in Atmospheric Science from the University of Washington in 1973. He then worked as a meteorologist for the U.S. National Weather Service until 2001, and as the lead forecaster in Montana from 1981 to 2001. An Ice Age Caused by the Genesis Flood. Institute for Creation Research, El Cajon, California, 1990. Ancient Ice Ages or Gigantic Submarine Landslides? Creation Research Society Books, 1997. Dinosaur Challenges and Mysteries : How the Genesis Flood Makes Sense of Dinosaur Evidence, Including Tracks, Nests, Eggs, and Scavenged Bones. Creation Book Publishers, Atlanta, Georgia, 2011. Flood by Design. Master Books, Green Forest, Arkansas, 2008. The Frozen Record : Examining the Ice Core History of the Greenland and Antarctic Ice Sheets. Institute for Creation Research, Santee, California, 2005. Frozen in Time. Master Books, Green Forest, Arkansas, 2004. The Geologic Column : Perspectives Within Diluvial Geology. John K. Reed and Michael J. Oard, editors. Creation Research Society Books, Chino Valley, Arizona, 2006. Life in the Great Ice Age. Master Books, Green Forest, Arkansas, 1993. 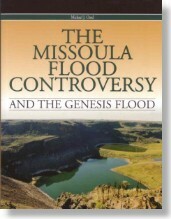 The Missoula Flood Controversy: And the Genesis Flood. Creation Research Society Books, Chino Valley, Arizona, 2004. The New Weather Book. Master Books, Green Forest, Arkansas, 2015. Road Guide to Yellowstone National Park and Adjacent Areas : From a Creationist Perspective. With Harold Coffin, John Hergenrather, Dennis Bokovoy. Creation Research Society Books, Chino Valley, Arizona, 2005. Rock Solid Answers : the Biblical Truth Behind 14 Geologic Questions. Michael J. Oard and John K. Reed, editors. Master Books, Green Forest, Arkansas, 2009. Uncovering the the Mysterious Woolly Mammoth. Master Books, Green Forest, Arkansas, 2007. The Weather Book. Master Books, Green Forest, Arkansas, 1997. Your Guide to the Grand Canyon. Master Books, Green Forest, Arkansas, 2008. Your Guide to Zion and Bryce Canyon National Parks : a Different Perspective. With Tom Vail, Dennis Bokovoy, John Hergenrather. Master Books, Green Forest, Arkansas, 2010. A Classic Tillite Reclassified as a Submarine Debris Flow Oard, M.J. Journal of Creation 11(1):7, 1997. Astronomical Problems Oard, M.J. Journal of Creation 9(1):5–6, 1995. Did Lucy walk upright? Oard, M.J.. Journal of Creation 15(2):9–10, 2001. Do Greenland ice cores show over one hundred thousand years of annual layers? Oard, M.J. Journal of Creation 15(3):39–42, 2001. End-mesozoic extinction of dinosaurs partly based on circular reasoning Oard, M.J. Journal of Creation 15(2):6–7, 2001. The extinction of the dinosaurs Oard, M.J., 1997. Journal of Creation 11(2):137–154. The extinction of the woolly mammoth: was it a quick freeze? Oard, M.J. Journal of Creation 14(3):24–34, 2000. How Well Do Paleontologists Know Fossil Distributions? Oard, M.J. Journal of Creation 14(1):7–8, 2000. Is catastrophic plate tectonics part of Earth history? by Michael J. Oard, Journal of Creation 16(1) 2002. April 2002. No Dark Matter Found in the Milky Way Galaxy Oard, M.J. and Sarfati, J.D. Journal of Creation 13(1):3–4, 1999. Polar dinosaur conundrum by Michael J. Oard. Journal of Creation 20(2):6–7, August 2006. Rapid Cave Formation by Sulfuric Acid Dissolution Oard, M.J. Journal of Creation 12(3):279–280, 1998. Watery catastrophe deduced from huge Ceratopsian dinosaur graveyard by Michael J. Oard. Journal of Creation 16(2):3–4, August 2002. Reed, R.J. , M.J. Oard, and M. Sieminski, 1969. A comparison of observed and theoretical diurnal tidal motions between 30 and 60 kilometers, Monthly Weather Review 97(6):456–459. Oard, M.J., 1974. Application of a diagnostic Richardson number equation to a case study of clear air turbulence, Journal of Applied Meteorology 13(7):771–777. Oard, M.J., 1977. A winter season minimum temperature formula for Bakersfield, California using multiple regression, NOAA Technical Memorandum, NWS-WR/113. Oard, M.J., 1980. Regression equation for the peak wind gust 6–12 hours in advance at Great Falls during strong downslope windstorms, NOAA Technical Memorandum, NWS-WR/154. Oard, M.J., 1982. Baroclinic prog biases in particular weather patterns and the use of analogs, Preprints of the 9th Conference on Weather Forecasting and Analysis. Oard, M.J., 1982. Peak wind gust regression equation for Great Falls 3–15 hours in advance during downslope windstorms, Preprints of the 9th Conference on Weather Forecasting and Analysis. Oard, M.J., 1984. Forecasting spring storms in Montana, Preprints of the 10th Conference on Weather Forecasting and Analysis. Oard, M.J., 1993. A method for prediction chinook winds east of the Montana Rockies, Weather and Forecasting 8(2):166–180. The Ice Age: Only the Bible Can Explain It Recorded at the Seattle Creation Conference, July 2004. Startling Evidence That Noah's Flood Really Happened Recorded at the Seattle Creation Conference, July 2004. Michael Oard while speaking during a breakout session at the Seattle Creation Conference 2005. Is Genesis Important? This talk shows that Genesis 1-11 is important because the challenge of the culture is causing a massive exodus of young people. Barna reports that 70% of young evangelical church-goers leave the church after graduating from high school. Answers in Genesis asked them why and found that about half doubted the Bible because of the long ages taught as fact in the culture. About 25% were influenced by evolution. The question of whether Genesis 1-11 can be interpreted differently than the straightforward historical meaning is addressed. The answer is a clear "no". The usage of the word “day” in Genesis 1 is given as an example in which the exegesis of the word in context means a 24-hour solar day. As far as the age of the earth, Jesus indicated three times that the earth was young. If the clear words of Genesis 1-11 can be distorted, then any clear passage in the Bible can be made to say anything. Biblical chaos has resulted with millions losing their “faith.” Great harm has occurred within the Church as a whole and continues. Genesis is indeed very important. We do not have to compromise with the worldview of naturalism because there is much scientific data to support Genesis. One example is the extreme complexity of the biological world, as shown by the cell, protein molecules, and DNA. As far as the old ages are concerned, the RATE project has shown that the millions and billions of years can be accounted for by a period of accelerated decay at the time of creation and possibly during the Flood. Both adults and young people need to learn this evidence, so that they can stand in a culture that is pushing evolution and old ages more and more. Second, evolution cannot be a fact because modern biology shows that every organism is vastly too complex to have evolved by chance, even with the pathetic mechanisms of mutations and natural selection. Furthermore, macroevolution is not seen in the fossil record because complexity is tremendous, right from the “oldest” organisms and the lack of the millions of transitional fossils required by macroevolution. Closed shelled mollusks also show that the rocks containing the fossils were deposited rapidly and worldwide. Third, evolution cannot be a fact because it is contradicted in the Bible. Genesis 1 states that organisms were created by kinds and created to reproduce within their own kinds and not into some other kind, which is evolution. Furthermore the order of creation contradicts the evolutionary order twelve times. The Bible also teaches and summarizes in Rom 5:12 that there was no death of man or the animals until man sinned, while evolution states that there has been mass death, survival of the fittest, etc., for hundreds of millions of years before man supposedly evolved at the very end. Is Evolution Probable? We are told by evolutionists that given enough time, what seems impossible becomes virtually certain, making evolution seem plausible. This talk provides a quantitative estimate of such an assertion, which goes against the second law of thermodynamics that states order goes to disorder with time in an isolated system. I use a very simple probability equation to show that not even one simple step in the supposed evolution of life from non-life can occur in the supposed age of the universe. Noah’s Flood: What Does the Bible Say? This talk lists the many reasons why Scripture clearly says the Genesis Flood was global, and that Jesus believed in a global Flood. It talks about details of the ark, such as whether it was roomy enough for all the animals. What we know about the pre-Flood environment is discussed as well as the controversial suggested mechanisms for the Flood. Worldwide Evidence for Noah’s Flood The evidence for the global Genesis Flood is provided by all the hundreds of flood traditions from all over the world. Evidence for the Flood is found in sedimentary rocks that commonly cover huge distances and show little or no erosion between layers—unlike how mainstream geologists interpret the rocks based on small events over millions of years. Trillions of fossils in the sedimentary rocks provide powerful evidence for a global Flood, since fossilization today is rare (remember that mainstream scientists rely on present processes to explain the past). Moreover, the fossil record does not show evolution because of the gaps in the fossil record. Mollusks that make up 95% of fossils are predominantly closed shelled, strongly indicating that they were buried and fossilized rapidly all over the earth. This points to a global catastrophe and not small events over millions of years, the alternative mainstream view. Lastly, the talk delves into what we learned about the Flood from the eruption of Mount St. Helens. Earth’s Surface Shaped by Receding Floodwater: First as Sheet Flow The talk first discusses what the Bible says about how the Floodwater drained from off the continents. Then geological evidence for parts of the Earth’s crust rising and parts descending to drain the Floodwater is presented. Geological evidence of sheet currents flowing off the continents is shown in the form of huge erosion of domes and the erosional remnants left behind. All the eroded sediment is deposited at the margin of the continents forming the continental shelf and slope. As the water is moving off the continents, sometimes at high speed, a rough surface is planed smooth by the debris being carried along by the Floodwater. These surfaces are called planation surfaces, if they are flat, and erosion surfaces, if they are rolling. A veneer of the debris is commonly left on top of the planation or erosion surfaces as a thin layer of cobbles and boulders. These rounded rocks from water action sometimes contain percussion marks caused by all the intense turbulence of the draining Floodwater. At the same time, resistant rocks are carried long distances from their sources, documented from the northwest states and adjacent Canada for transport distances of up to 800 miles. All these features are difficult if not impossible to explain by the alternative ideas of mainstream geologists. Earth’s Surface Shaped by Receding Floodwater: Last by Channelized Flow After sheet flow continued for many days, more and more mountains and plateaus extended above the draining Floodwater, forcing the water to channel around these objects. Channelized flow, therefore, carves valleys and canyons rapidly, and creates many other features that are difficult if not impossible to explain by mainstream geologists. Such features include water and wind gaps, which are perpendicular cuts through mountains, ridges, or plateaus; pediments, which are planation surfaces at the foots of mountains or ridges; and submarine canyons that are cut perpendicular to the shoreline through the continental shelf and slope. What is the Origin of the Grand Canyon? The origin of the Grand Canyon has been a huge mystery for mainstream scientists for over 150 years. This is demonstrated right away in this talk. Then the talk goes into the two creationists hypotheses for the origin of the Grand Canyon. It shows that the post-Flood dam-breach hypothesis, supposedly happened when 2 to 3 lakes positioned east of Grand Canyon by the draining Flood waters, breached several hundreds years after the Flood. There are many problems with this hypothesis, two of which seem fatal. The second creationist hypothesis is more likely and that is the Grand Canyon was carved late in the Flood by rapid channelized erosion. Evidence for this is presented as well as how each segment of the Grand Canyon can be carved by the draining, channelized Floodwater. The Ice Age: Only the Bible Can Explain It! The Ice Age is a major mystery for mainstream Earth science, the difficulty of which is analyzed in the talk. The evidence indicates that the Ice Age occurred after the Flood, so the Flood must have resulted in a climate change right afterwards that resulted in a rapid Ice Age. Many details of the Ice Age have been worked out from over 30 years of research, such as it was only about 700 years long, there was only one ice age, the Greenland and Antarctic Ice Sheet mostly built up during this time, animals of the Ice Age were a mix of warmth-loving and cold-loving types, the existence of big lakes in now dry areas of the Earth, and the mass extinction at the end of the Ice Age. Whatever Happened to the Woolly Mammoths? This talk shows that the woolly mammoth lived during the Ice Age; they did not die early in the Flood by a quick freeze. It focuses on the mammoths in Siberia and answers many mysteries of why they would live in Siberia, what they would eat, and how they died. Many other mammoth mysteries are also answered by the post-Flood rapid Ice Age, such as why the lowlands of Siberia, Alaska, and the Yukon were not glaciated; why there were so many large animals so far north; why some mammoth carcasses are found in a generally standing position, having suffocated; and why some have broken bones. What Does the Lake Missoula Flood Teach Us? This talk describes the abundant evidence for the existence of glacial Lake Missoula at the peak of the Ice Age and its bursting forth creating the Channeled Scablands of eastern Washington in a matter of days. It focuses on the question of why practically every mainstream earth scientist rejected the Lake Missoula flood for 40 years, despite an overwhelming amount of evidence. The reason shows their bias against big events and shows why they will never see evidence for the Genesis Flood that stares them in the face. Now that mainstream scientists have accepted the Lake Missoula flood, they have gone on to postulate anywhere from 40 to 100 at the peak of the last ice age, not to speak of their other 30 supposed ice ages in the past 2.5 million years. Obvious evidence is presented that there really was only one large Lake Missoula flood. The features left behind from the Lake Missoula flood are then used to show that similar features all over the Earth were caused by a global Flood. Is Man the Cause of Global Warming? Global warming seems to be the major topic of concern by many environmentalists, the media, and politicians. There is a huge amount of hysterical statements made by many, and there are many contradictory statements floating around in the culture. This talk goes first into the facts and second what are likely facts, based on the scientific literature. From this data analysis, we can clear away much of the fog on this issue. We can understand what is going on with this hot button topic. Dinosaur Tracks, Eggs, and Bonebeds Explained Early in the Flood Despite being able to explain many big-picture observations of the rocks and fossils, there are still a few hundred earth science challenges to the Flood model of earth history. One of these challenges is the existence of billions of dinosaur tracks, millions of dinosaur eggs, and scavenged bonebeds on thousands of feet of Flood strata. Such observations seem to imply too much time to have happened early in the Flood before dinosaurs were all dead by Day 150. However, a closer examination of the bonebeds, tracks, and eggs indicates many unusual features for a uniformitarian environment. Unique features of bonebeds include the observations that some dinosaur graveyards are huge, monospecific, and lack babies and young juveniles. Unique features of dinosaur tracks are that practically all trackways are straight, tracks are always on flat bedding planes, and baby and young juvenile tracks are rare. Several unusual features observed with dinosaur eggs are that they are practically always laid on flat bedding planes, despite their significant porosity that would result in the death of the embryo, and nest structures are very rare. Such observations from all across the world suggest that another hypothesis is needed. An hypothesis will be presented to explain the dinosaur data, which has been previously suggested in the creationist literature. This is the BEDS (Briefly Exposed Diluvial Sediments) hypothesis, which postulates that after rapid sedimentation during the Genesis Flood, the distance between the top of the sediment and the Floodwater surface became shallow. Such sediments would then become vulnerable to exposure by local drops in relative sea level caused by five mechanisms operating during the early Flood. There would of course be local rises in relative sea level inundating the BEDS. There could be hundreds of local sea level oscillations of various amplitudes and periods on BEDS during the first 150 days of the Flood due to all five mechanisms. Interference patterns from all the mechanisms would reinforce sea level lows and highs. Dinosaurs swimming in the water, finding refuge on log mats, or trapped on higher refuges then could walk on BEDS and lay eggs. A gentle, local rise in relative sea level would cover up the tracks, eggs, and dead dinosaurs, preserving and eventually lithifying or fossilizing them. Because of all the oscillations in local sea level, there could be multiple layers of tracks and eggs at any one location. The BEDS hypothesis also can potentially explain a number of other seemingly puzzling features associated with dinosaur tracks and eggs, such as true mudcracks, raindrop imprints, coprolites, ripple marks, “paleosols,” burrows and tracks of invertebrates, possible social insect nests, and bird tracks. BEDS can also explain these features when not associated with dinosaur tracks. Waters gaps are common in the Uinta Mountains. These water gaps are also nearly impossible to explain by uniformitarianism but can be readily explain by Flood runoff. The pediment and water gaps were formed during the Cenozoic and therefore the Flood/post-Flood boundary is in the late Cenozoic in this area. The pediment also caps sedimentary rocks of the Green River and Bridger Formations, making these formations Flood formations. ↑ Michael Oard Creation Ministries International. Accessed November 11, 2015. ↑ Board of Directors 2015 Creation Research Society. Accessed November 11, 2015. This page was last modified on 6 July 2018, at 12:30.